The album contains 34 striking images of kabuki actors by six late 19th century woodblock print designers: Utagawa KUNISADA I (1786-1864), Utagawa KUNISADA II (1823-1880), Toyohara KUNICHIKA (1835-1900), Utagawa KUNIAKI II (1835-1888), Utagawa YOSHICHIKA (fl. 1850-60 in Osaka) and Utagawa KUNIHISA (1832-1891). 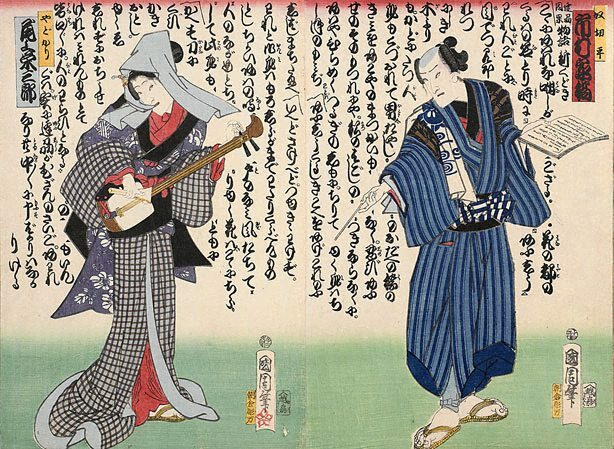 The album includes 27 multiple-sheet sets and 7 single-sheet prints, mostly dating from the early 1860s and therefore representing the last flowering of the 'ukiyo-e' woodblock print tradition. Published as sheet prints and bound together soon after publication by a Japanese collector, the prints have survived in superb condition. Almost without exception, they are fine impressions. They all show the brilliant colours typical of the period, when imported aniline dyes were being used to dramatic effect. Asian Art Department, AGNSW, August 2005. (right sheet) signed "Kunichika hitsu", Asakura Choman's block carver's seal, Echizen'ya Etsuka publisher's seal; (left sheet) signed "Kunichika hitsu", Asakura Choman's block carver's seal, Echizenya Etsuka publisher's seal.